The armies of Confederate Gen. Robert E. Lee and Union Gen. George G. Meade have been moving closer and closer to one another in the past week. Today, they collide west of Gettysburg, a town where several highways intersect. The initial contact between Lee’s Army of Northern Virginia and Meade’s Army of the Potomac takes place in the form of a clash between advance troops in the morning. The sound of cannon fire is heard by nearby units, and by noon a full-scale battle is underway. Confederate forces significantly outnumber their counterparts and gradually push Union troops southeastward through town. Throughout the day, reinforcements arrive for both the rebels and the federals. During much of this time, Union Brigadier Gen. Abner Doubleday (from a Baptist family and considered by many as the inventor of the game of baseball) commands Union forces. Outnumbered and on the defensive, Doubleday holds his troops together as they slowly retreat. Late in the day, Union troops regroup and make a stand on high ground on Gettysburg’s southeastern edge, from Culp’s Hill (on the right), along Cemetery Hill and Cemetery Ridge, and to the base of Little Round Top (to the left). Confederate forces, meanwhile, secure control of the town and form a six-mile line facing their counterparts. 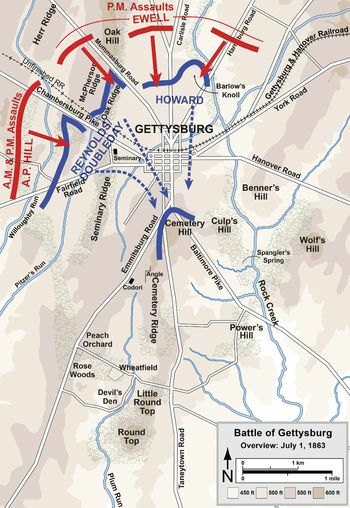 Sensing that controlling the currently-held Union high ground would be crucial to the outcome of the battle, Lee orders Lieutenant Gen. Richard S. Ewell to attack Cemetery Hill “if practical,” but Ewell determines that his weary troops are not capable to the offensive, and declines. Ewell’s decision may well be the turning point of the battle in favor of the Union. Night falls. Under the cover of darkness reinforcements continue arriving on both sides of the battle lines. News of the battle is localized at this point. Far to the South this day the conditions in Union-sieged Vicksburg are turning desperate. Lack of food and bad sanitary conditions, resulting in much sickness and death, have weakened the city’s defenders. Against this backdrop, North Carolina J. D. Hufham, the editor of North Carolina Baptists’ Biblical Recorder, unaware of the day’s events, today presciently calls upon Southern Baptists to pray for the Confederacy. Somber yet defiant, Hufham’s words are read by Baptists of the South who will not learn about Gettysburg for days to come. To every patriot the present is a season full of solicitude. We are evidently on the threshold of great events which must go far towards deciding the destiny of this war and our country. Even while we write they may be occurring, and we would earnestly insist on the necessity for christians to offer up fervent, united prayer for the success of our cause. Let them make full use of this instrumentality for securing the blessing of God, without which no enterprise can prosper. A glance at the present condition of things along our borders will be sufficient to show the truth and importance of what we have said. A large part–if not the whole–of the army of the Rappahannock has left its old quarters, and abandoned its defensive attitude; has assumed the offensive and penetrated into the enemy’s territory. How much depends on the success or failure of the movements in that quarter we can not now fully understand, but we know that vast interests are at stake there. Meanwhile the enemy is threatening the Capitol of the Confederacy from the rear.–That our authorities are prepared for them we fully believe, but the fate of battles depends on so many contingencies that no one can feel safe or free from solicitude while one is pending. The Southern papers intimate that Charleston, so lately the scene of a glorious triumph of Southern valor and skill, may soon, again be the theatre of a fierce conflict. The fate of Vicksburg and Port Hudson, by general consent the most important points in the Confederacy, still trembles in the balance. The garrisons hold out bravely though so closely besieged and hard pressed, and every effort possible is being made to relieve them; but what the result will be is known only to Him who rules above. That we should be successful at all these points is of great moment to us, will be clear to all. In that event we will have demonstrated even to the obtuse minds of our enemies the impossibility of subjugating us, and we may hope for a speedy termination of the war. If on the other hand, we should be beaten there, our enemies will be greatly encouraged and the contest will be indefinitely prolonged. The South can never yield while there is one hope of success left. To submit to a foe so brutal and bloodthirsty, to go back into a Union with men who are so far lost to every principle of honor, civilization and humanity–to say nothing of religion–are not to be thought of for a single moment. With these tremendous interests at stake and soon to be decided, let us remember the source of help and strength. Let us go to Him, who holds our destinies in His hands; go to Him in earnestness and faith, and implore His blessings.